The Battle of Samara Bend or the Battle of Kernek was the first battle between Volga Bulgaria and the Mongols, probably one of the first skirmishes or battles the Mongols lost. It took place in autumn 1223, at the southern border of Volga Bulgaria. The Bulgars retreated and the Mongols pursued them. Then the main Bulgar forces ambushed the Mongols. This Mongol campaign had destroyed perhaps as many as 200,000 soldiers of various nations and never lost a major battle. At this point in history, the Mongol army was the finest army in the world - it was professional, extremely well trained and equipped, a Mongol rose through the ranks based on his merit rather than his position in Mongol society, and generals such as Jebe and Subutai along with the Great Khan had developed revolutionary tactics all controlled with iron discipline. It's mobility was unmatched by any other military force. The utilization of the Mongolian horse (steppe pony) allowed for survival of their steeds in areas where other horses would starve or die from conditions. The Mongol commanders also realized the quality of their army and were not impressed by the mere size of the opposing forces of their enemies. In this way they could stand and hold, and their various tactics would often cause an enemy to break and retreat in a panic that inevitably lead to a route from Mongol mounted archers and lancers. They often employed siege engines and engineers from China and Persia in their ranks to enable them to take fortified cities - however, this would not have been practical on the fast-campaign of Jebe/Subutai. This was the army now marching to face the Bulgars on the Volga. The Volga Bolgars/Bulgars had built up a powerful state in the second half of the 7th century between the Sea of Azov and the Kuban valley. They were apparently of Turkic origin and related to the Kutrigur Huns. Some of them migrated to Europe, forming an empire there in the Balkans. The rest slowly moved northward in the direction of Kama and Kazan to found Great Bulgaria. The Volga Bulgars on the Volga-Kama region embraced Islam in 922, becoming an important trade center between the Islamic world and Europe. The Volga Bulgars formed a settled civilisation with towns and Islamic culture till the Mongol invasion. Although there were peaceful relations with Kievan Rus in the 10th and 11th centuries, the principality of Vladimir-Suzdal was expanding its domain on the middle Volga during the 12th century, and their attempts to monopolize the Volga trade resulted in hostilities with the Volga Bulgars. Various Bulgar towns and villages were conquered by the Russians - Brjahimov (old Bulgar), which forced the Bulgars to establish a new capital at Bilar (Biljarsk, Biler), and eventually the most important Bulgar town on the eastern side of the Volga, Osel, was captured. The Bulgar state had been weakened by these conquests. During the mopping-up operations of the Mongols on the Dnieper, a messenger arrived from the Great Khan ordering Subutai and Jebe to return to the Volga river, locate Jochi and return with him to Mongolia. According to historian John Chambers, "The delayed arrival of the reinforcements which were at last advancing towards the Volga and the absence of Jochi from a preliminary briefing with his father had not been due to illness. Jochi was an imaginative and determined commander, as his campaigns in Khwarizm had shown, but his headstrong independence had made him unreliable . . . He (the Khan) had hoped that under the influence of his two most distinguished generals Jochi might return to (the Khan's) camp where they could flaunt a family loyalty that would crush any hope of intrigue (by Jochi's detractors.)" Jochi brought a single tumen (10,000 men) to reinforce the army of Jebe/Subutai, meeting on the west bank of the Volga. The old directive was no longer in force per the orders from the messenger, but the return journey home gave them the opportunity to reconnoiter the north-western boundaries of the Mongol Empire. They reduced the Bulgars on the west bank of the Volga before an attack was made further north. 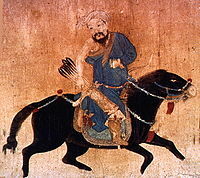 Drawing of a mobile Mongol soldier with bow and arrow wearing deel. After the Tatars had treated the Rus as we have described and plundered their country, they withdrew and went to the Bulghars in the year 620 [1223-1224]. When the Bulghars heard of their approach, they laid ambushes for them in several places. They then marched out to engage them and drew them on until they had passed the ambush site. They emerged behind their backs, so that they were caught in the middle. They fell to the sword on every side. Most of them were killed and only a few escaped. There is another version, however. They numbered about four thousand and they set out for Saqsin on the way back to their ruler, Chingiz Khan. The lands of the Qipjaq became free of them and the survivors returned home. In Peter Jackson's expert-opinion, the second passage relates to the size of Jebe/Subutai's army, not the number of Mongol "survivors" from the ambush - however, there is no mention in the alternative tale of any encounter with the Bulgars. In this history, no mention is made of who commanded the military probe that was ambushed, or how large it was. Historian A.H. Halikov identifies the Bulgarian army commander as Ilgam Khan. Based on the record of Jebe and Subutai's entire careers, masters of ambush themselves, a military conundrum exists in that a weakened Bulgar state would be able to defeat them. However, if Jochi was in command, it may be significant that upon the return of the Mongol force to Mongol territory, Jochi entered his father's tent, interrupting an audience, knelt before the throne, and placed Jenghiz's hand upon his forehead, the Mongol stance for utter submission. Various historical secondary sources - Morgan, Chambers, Grousset - state that the Mongols actually defeated the Bulgars, Chambers even going so far as to say that the Bulgars had made up stories to tell the (recently crushed) Russians that they had beaten the Mongols and driven them from their territory. However, historian Peter Jackson points out there is no reason to doubt Ibn al-Athir, and that Chambers' may be indulging in speculation. Historian Zimonyi Istvan takes the stance that the Mongols suffered a reverse: "The Mongols first attacked the Volga Bulgars immediately after their victory in the battle of Kalka in 1223. They were then entrapped and defeated by the Volga Bulgars. The Mongols made minor raids against the southern and eastern border of the Volga Bulgar country in 1229 and 1232." Whatever the case, after this battle the Mongols skirted the Urals defeating the Saxin tribes (east Saxons) there and then moved south to defeat the eastern Cumans (Kanglis), where the Cuman army was destroyed, their khagan killed, and they were forced to pay a large tribute to the Mongols. This would hardly have been possible if the Mongol force had been severely damaged at the "Battle of Samara Bend." The details about the Bulgar ambush have not survived. The reverse (if one indeed occurred) at the "Battle of Samara Bend" did not stop the Mongol expedition from reducing the Saxin tribes and defeating the Kanglis afterwards. Laden with tribute, the Mongols then returned home. However, Jebe Noyan - one of the Khan's greatest generals and friends - died of a fever on the Imil River in Tarbagatai on the journey. In 1236 the Mongols under Batu and Subotai returned to Bulgaria and made it part of the Mongol Empire. ↑ Stephen Turnbull, Ghenghis Khan & The Mongol Conquests, 1190-1400, Osprey Publishing, 2003. ↑ 6.0 6.1 Zimonyi Istvan: "History of the Turkic speaking peoples in Europe before the Ottomans". The lectures include the history of the Turkic speaking peoples of Eastern Europe from the Huns to Kipchaks 4-14th century.